Chroma-Q’s award-winning lighting products deliver premium performance for - and have been adopted by leading users in - some of today’s most demanding and prestigious lighting applications, including opera, theatre, film and TV, venues, touring, events, retail, houses of worship, and others. 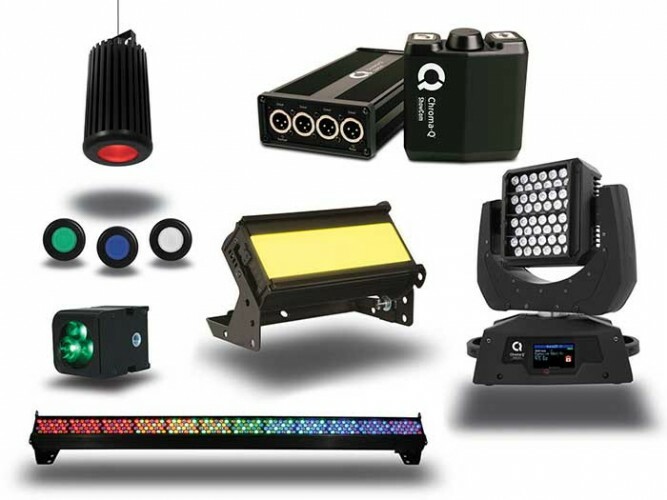 The company’s PLASA stand (P60) will feature models from the Color Force, Studio Force and Inspire ranges illuminating various surfaces, to demonstrate the LED products’ meticulous colour accuracy and consistency, and precise theatrical grade dimming – features which together are designed to deliver the highest performance levels from a lighting instrument. Making its PLASA London debut is the award-winning Inspire LED house light, a powerful multi-purpose creative lighting tool that can transform the look and feel of both large performance spaces and smaller commercial, retail or leisure environments with its precise dimming, homogenised light output and extensive colour palette. Also showing for the first time is the new DC battery powered version of the award-winning Studio Force V 12 Phosphor variable white lighting fixture. The Phosphor variable, daylight and tungsten white models provide a beautifully soft, even light source with a massive output for their compact 12" / 330mm length size. The variable white model includes remote onboard adjustment of hue, kelvin and level, to control not just the colour but also fine-tuning of the green and magenta tints. With their versatile feature set, the fixtures are ideal for location work. Other models featured include the new Color Block 2 Plus Nano LED system – versatile single cell versions of the popular Color Block 2 Plus fixture which are perfect for discreet placements such as set piece, architectural and stage lighting. In addition, the stand will showcase Auto LED II – an LED moving light specifically designed to provide the very precise illumination demanded for motor industry tradeshows, high end fashion events and premium retail environments. Receiving its UK launch is the new ShowCom, a compact, rugged, cost-effective show intercom beltpack which combines professional level, reliable production communications with operation which is simple enough for anyone to use. Stop by the stand to receive a demo of the Chroma-Q product range. In picture: (top to bottom row): Inspire LED house light, ShowCom show intercom beltpack, Color Block 2 Plus Nano LED system, Studio Force V 12 Phosphor DC battery operated version, AutoLED II LED moving light and Color Force 72 LED batten.